Download the plugin manually from the Wordpress plugin directory or from within the Wordpress admin. After activating it, you'll see a formats select box and a code button appear in the toolbar of the editor. If the cursor is not in a PRE or CODE tag, you cannot select a language. When the cursor is in a PRE or CODE tag, you can select or toggle a language. Download the script, language file and stylesheet and add these to your HTML file. Add the language classes to each PRE and CODE element you want to have highlighted. The classes are the keys of the Highlighter.Language object in the language file. You can simply add other languages by extending the Highlighter.Language object. See the language file for examples. There are 4 classes defined in the stylesheet. 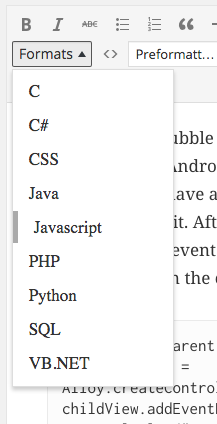 If you want to change the styles for all languages, just edit it in there or overrule them with your own css file. * Created by Michiel on 12-12-2014.